In the last few years all the Mi’kmaq communities, municipal, provincial, and federal agencies and citizens with an interest or responsibility in the Bras d’Or watershed have banded together to work on a management plan for the Lakes. A unique declaration, the Bras d’Or Charter, was signed by all these groups, which committed them to the Bras d’Or Lakes Collaborative Environmental Planning Initiative (CEPI). The spirit of the Charter is the collaboration: one eye on our past history and teachings, and one eye on modern science (Two Eyed Seeing). All agencies and peoples work together, bringing their statutes, expertise, and interests to the group. Information and ideas are shared. 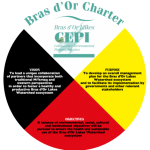 The official title “Bras d’Or Charter” was constructed around the Vision, Objectives and Purpose for the Bras d’Or Lakes CEPI agreed upon at the 2004 workshop. 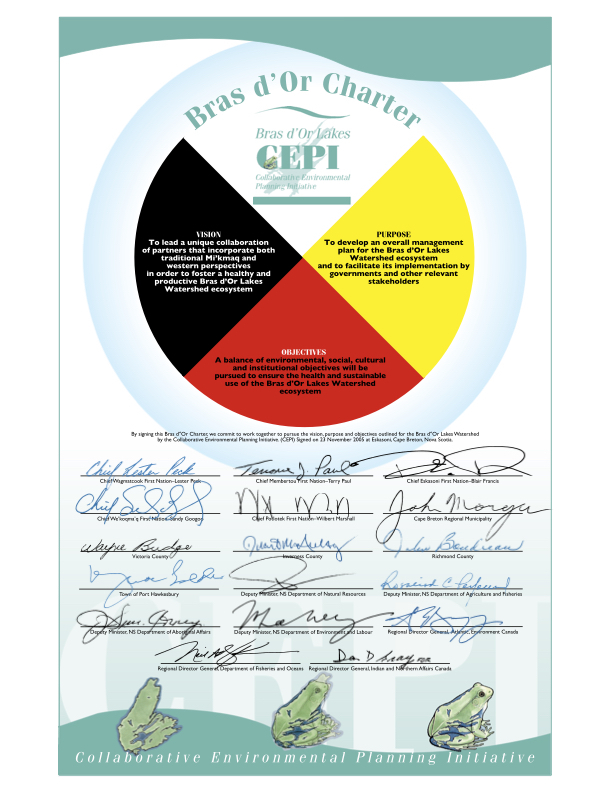 The seventeen signatures affixed to the document represent the collective intent, or “will”, of the relevant governments with responsibilities for the management and protection of the Bras d’Or Lakes and its watershed. It includes the signatures of Nova Scotia Provincial Government Deputy Ministers and Government of Canada Directors-General, Municipal Wardens/Mayors, and Mi’kmaq Chiefs. The Charter is a truly historic document and lays the foundation for a unique and inspiring form of collaboration that cannot be found anywhere else. Its existence is extremely significant. The jurisdictions (or responsibilities) for each of the signatures on the Charter are reflected in the geographical boundaries of their designated lands and through statutes and laws or acts of various levels of government. These laws direct how we are to conduct ourselves in carrying out activities in our daily lives, designed to prevent damage to the health of the watershed and its ecosystem. However, gaps do exist in these complex laws and regulations.